It didn’t take long for me to become accustomed to waking in the mornings with the stiffness of RA suffocating my sleeping joints; I wake and move them from their frozen state, my blood flows, beginning the arduous process of rousing them from their spell. On one particular morning, I peeled myself from the bed, and in my first tentative moments, I detected a new entity had entered my body. My lower back felt rigid and hard, as if a board had been hammered across it. I could almost hear the brittle crackle of rusty flakes crumbling away when I bent over. I was baffled – where and when did this sudden new stiffness arrive? This was the first time I experienced the cold stiff presence of old lady RA in my lower back. I wobbled through a few days, pining at the absence of my flexibility acquired through years of dance training; some days the stiffness abated by afternoon, other times, it stuck around for the whole day. I had difficulty twisting or bending down to pick up dropped objects. I bore the constraint of old lady RA’s rigid grip, feeling a bit like a mannequin in a storefront window. Their plastic bodies stand frozen in the windows, modelling the latest fashion trend, stiff necks and hollow faces staring out at the world bustling past. 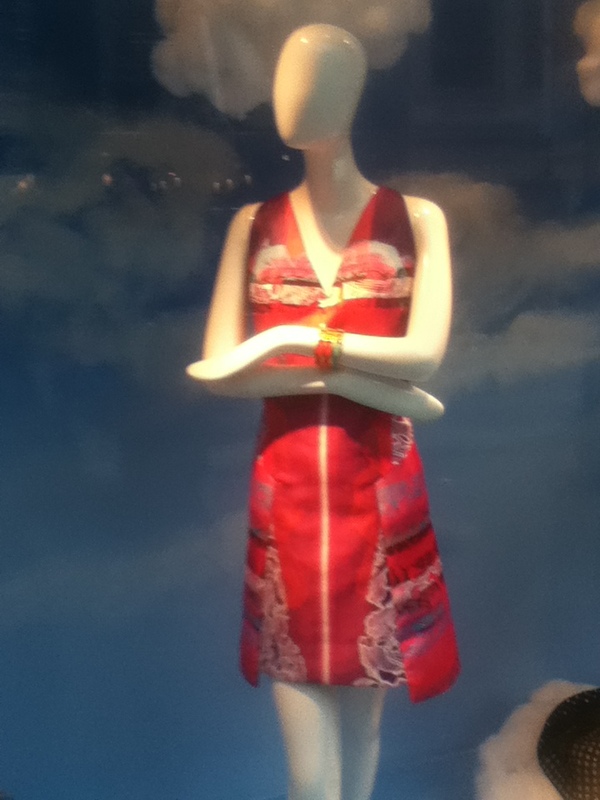 I hobbled along the sidewalk, a stilted figure crackling along the pavement wondering how much money I could make if I decided to stand in a storefront window wearing the latest fashion. I decided, rather quickly, that I wasn’t cut out to be a mannequin – I had neither the desire nor the temperament for a permanent position in life. I decided to take action. I started with the soothing heat of a hot water bottle and warm baths to stimulate blood flow; I returned to a daily routine of gentle yoga, conjuring up mental images of a carpenter extracting nails from a rotting board and peeling it away from my back. After a few days, the stiffness relinquished its grip, and I was freed from the old lady’s mannequin curse, changing my position, and my clothes, at my own will. I know this was not funny but I couldn’t suppress a smile as I thought about you contemplating a new career as a mannequin. I hate these new surprises from RA. They’re definitely the gifts that keep on giving. Sending hugs. New reader here — it’s been a challenge to get a hold on my arthritis but your blog gives me another “grasp” of the situation. Thank you for your insight. Thank you for visiting. It does take some time to find a new way to live with arthritis. I hope you can reign in your “old lady” and keep her on a tight leash. Stay well. I had no idea about your R.A….I have PSA for over a dozen years now. A lot of my symptoms have improved taking cortesol manager for stress. I take methotrexate too. Hi Lou-Lou, yes, I was diagnosed over four years ago… it’s been quite a journey. Thankfully, my rheumy hasn’t tried me on Methotrexate. I’m hoping I won’t need it, although, it probably would be the next step. I hope your arthritis does not give you too much trouble. Thanks for stopping by 🙂 Cheers. Excellent analogy. Sometimes I call myself the tin woman. Heat definitely works to oil those flaming joints. Hope you feel lots better now.